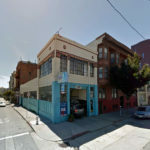 Plans to level the long-standing tire and auto shop building at Turk and Larkin in the Tenderloin, which Kahn & Keville has occupied since it was built in 1935, have been drawn. 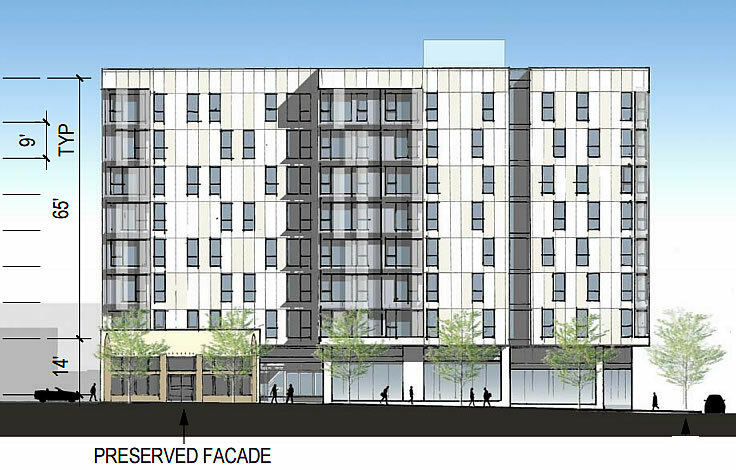 And as proposed, the Tenderloin Neighborhood Development Corporation (TNDC) will construct an eight-story building, with 121 affordable apartments, parking for 150 bikes, and two retail spaces, on the 500 Turk Street site. 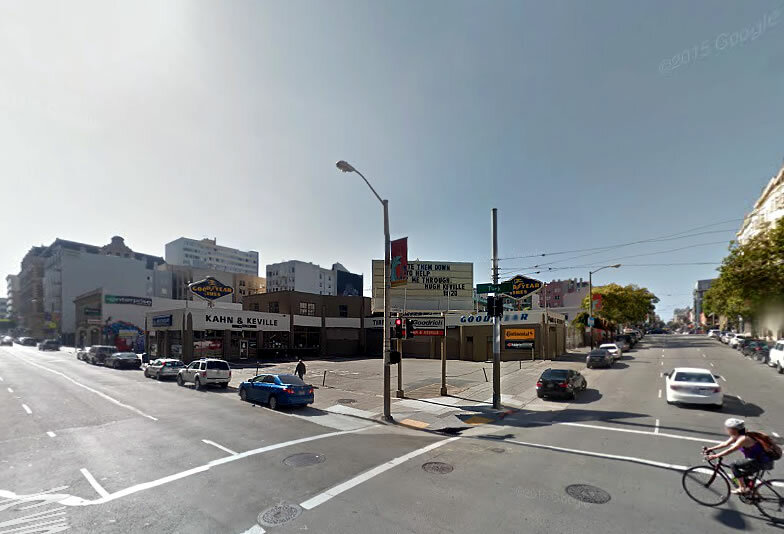 And yes, Kahn & Keville’s iconic letter board sign on the corner, which has been adorned with quirky and inspirational messages for over thirty years, will disappear as well. 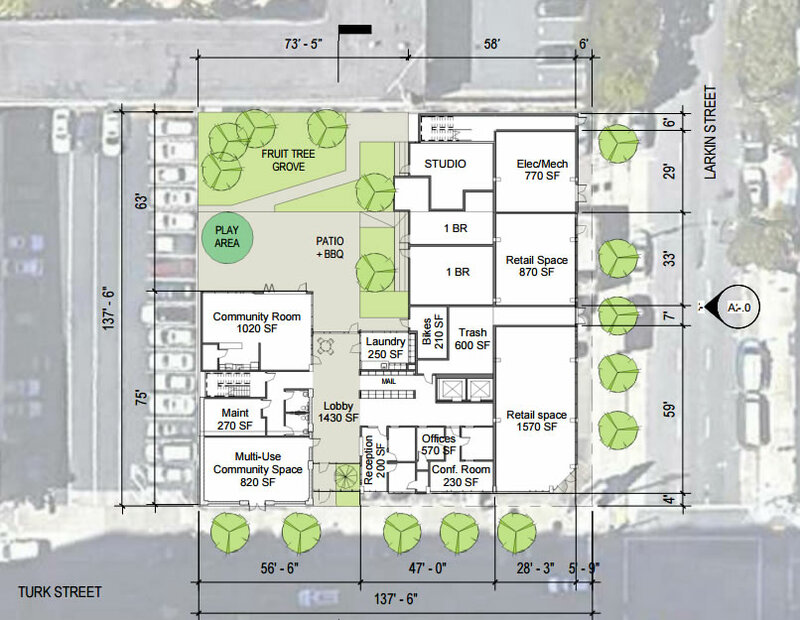 But a portion of the existing building’s façade facing Turk Street would be preserved and incorporated into the development as designed by David Baker + Partners, acting as a shell for a small community center and framing the building’s entry court and residential lobby which would lead to a 5,150 square foot courtyard, garden and play area for residents of the building. 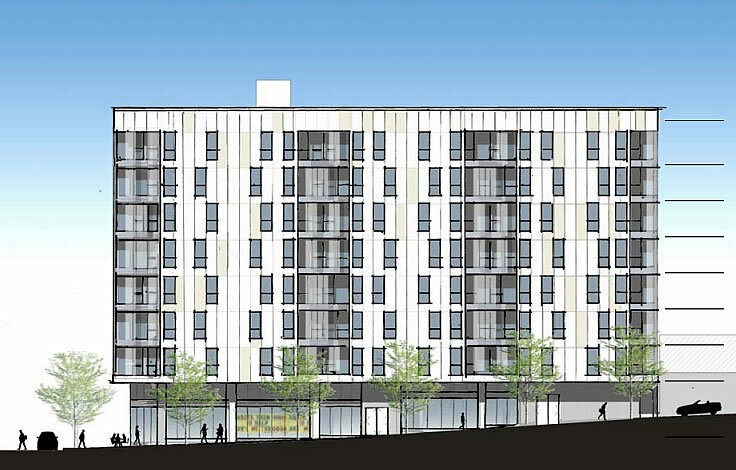 Good use of the site; affordable units and simple modern expression. David Baker’s work keeps getting better. Really? We’re preserving the facade of a side wall of a tire shop? I’m a believer in historic preservation of worthy architecture or buildings of historical significance. But this seems like madness. 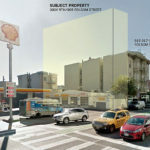 “This is one of more than 115 buildings along the Van Ness Avenue corridor that have a history as automobile support structures, and that are being evaluated for possible historic significance according to the criteria of the California Register of Historical Resources. With a few exceptions, these buildings were auto showrooms, public garages, auto repair shops, auto parts and supplies stores, and auto painting shops. The time period that is being studied is from the initial years of the automobile industry in San Francisco through 1964. Among the factors that have been considered when evaluating a building are its date of construction, its longevity of auto-related use, the importance of its occupants in local auto industry history, integrity, and architectural quality. These factors, and how they apply to evaluations of buildings, are discussed in a cover report, Van Ness Auto Row Support Structures, 1908-1964. Completed in 1935, this is a moderately late example of an automobile tire and battery shop. With 29 years of such use in its history (to 1964), it has good to excellent longevity in this use. Although this building was not one of the earlier examples of a building that had such uses, it had these uses for longer than almost any other building, and has extremely high integrity. It is also clear that Kahn and Keville were major tire dealers in San Francisco, specializing in Goodyear practically from their founding. For these reasons, 500 Turk appears to be eligible for the California Register of Historical Resources under Criterion 1, at the local level, for its use as an automobile tires and batteries shop. The Period of Significance under this criterion is 1935-1964, the years the building had this use (through 1964). Harry H. Kahn and Hugh J. Keville had substantial longevity as tire and battery dealers. They were small-scale dealers until they moved to this building in 1935, and then had one of the larger tire and battery shops in the city. On balance, they do not seem very significant in the general automobile related history of San Francisco. More research, however, could change this assessment. For now, this building does not appear to be eligible for the California Register under Criterion 2. Still don’t see the value in any of that, it’s like they are inventing a reason to preserve it. Preserving that very tiny portion of the original façade will not hurt the new development, nor add any significant cost to it. What’s wrong with reminding the future generations who will live here a little bit of our past? You’re kinda free with other people’s money. There is indeed a cost to preserving the facade. There’s a cost to selective demo around the facade. There’s a cost to shoring the facade during construction. There’s a cost to have to stage around. There’s a cost. I’m guessing you are an architect. I said “significant” cost. This is worth saving. What’s sad is that this is what passes for history. It’s old but it’s not important. Yes, there used to be more auto-related businesses, but it’s not like there are chapters in history books (architectural or general) about the importance of auto-service infrastructure in San Francisco. Maybe if this was Route 66, or the first of its kind, etc. But it’s not an important story. We’re preserving footnotes. I can’t really say I *care* but it’s just a bit laughable. But this does pass for history. You seem to be demeaning it, perhaps because of the small scale or the simple expression of a working class business. It’s still important. To ignore our past is to have a meaningless future. Our future is meaningless without the facade of a tire shop? Then keep laughing Frisco. And we are thankful you are not in charge of our future. I love that New York will just blast away historic buildings to construct something like the One Vanderbilt tower and we’re over here worrying about a garage. I actually like preserving the garage in this instance (since it serves a programmatic purpose). However, REQUIRING these structures to be preserved goes too far. Our tax dollars at work! I’m sure Mssr’s Kahn and Keville are laughing in their graves. They should add a plaque on the sidewalk memorializing the parking lot… I mean “automobile support” so future generations will know that there used to be a parking lot here. It’s very important that we remember. We shouldn’t stop there. I’m appalled that this historic designation does not also mention what it was before it was a parking lot. What was there before 1935? A house, perhaps? Where people lived? Perhaps a store? All that history at risk of being lost! great news cuz waste of good housing space if left as is. “Iconic tire shop.” Only in San Francisco. I’m not blaming you, SocketSite, I know you’re just the messenger. I’m just saying. If anything, it’s the esoteric messages on the sign that are iconic. That sign is a local landmark. I walked by that sign about every day for nearly a year. Love it – messages like “We’d like to welcome Twitter to the neighborhood, but we have way too many characters” and “The worm finds it interesting that we do not eat our books.” I’d let them knock down all the walls, but make them keep that sign. I’ll miss the sign. I always make a point of checking out its message whenever I’m driving by there. I really love the Goodyear station and the neon signs… just not the parking lot or auto repair. How cool would it have been in they built housing on the parking lot, left an alley between the old and the new structures, turned the rear portion into a pedestrian mall with spaces that would rival Belden Place. Call it Goodyear Alley or something. Give the developer a height bonus for historical preservation. Except Belden Place is in the heart of downtown, and this is at the edge of what might be termed…uhm, a slum. Maybe Syringe St. or Quickie Ct. or something like that. Though your idea brims with optimism, I think the mixed history of public spaces in the Tenderloin might give pause to the concept. You might be a little out of touch and perhaps a little snobbish. Have you seen all the developments even in the heart of the TL today? Anyway, good spots in the TL have no problem finding customers. People used to line up down the block at Dottie’s True Blue Cafe in the heart of the gutter poop district. Yes, Maybe (or pragmatic…semantics). No. But I still stand by my belief that an analogy to Belden Pl goes overboard: however many Dottieista’s there may be standing in line, I don’t think it compares to the ~350K working within easy walking distance of the former. Very excited for this project. Larkin is quite the scene now. Any idea for a timeline with this? The Vietnamese community is dropping the ball here not “requesting” below market rent for Vietnamese businesses and programs ala Oakland Chinatown activists, and assurances that 20%, nay 33% of the units be allocated to Vietnamese people. Sure, it’s silly to preserve this façade, but that’s what you get after the Golden Gate Redevelopment Area and Western Addition I and II and on and on. Take it up with Justin Herman if you’ve got a problem with it. At least this one is getting built. The neon sign is pretty nifty too. Can we keep it along with the backlit sign?